For other uses, see Bissen (disambiguation). 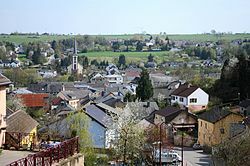 Bissen (Luxembourgish: Biissen) is a commune and town in central Luxembourg, in the canton of Mersch. It is situated on the river Attert. As of 2017[update], the town of Bissen, which lies in the east of the commune, has a population of 3,021. Bissen is home to a steel factory, operated by Arcelor, the world's second-largest steel manufacturer. This page was last edited on 11 March 2019, at 09:20 (UTC).